I may have been a bit hasty in declaring that all the ugly parts of the walk were behind me at the end of leg 3. Leg 4 had its share of derelict buildings and demolition sites. 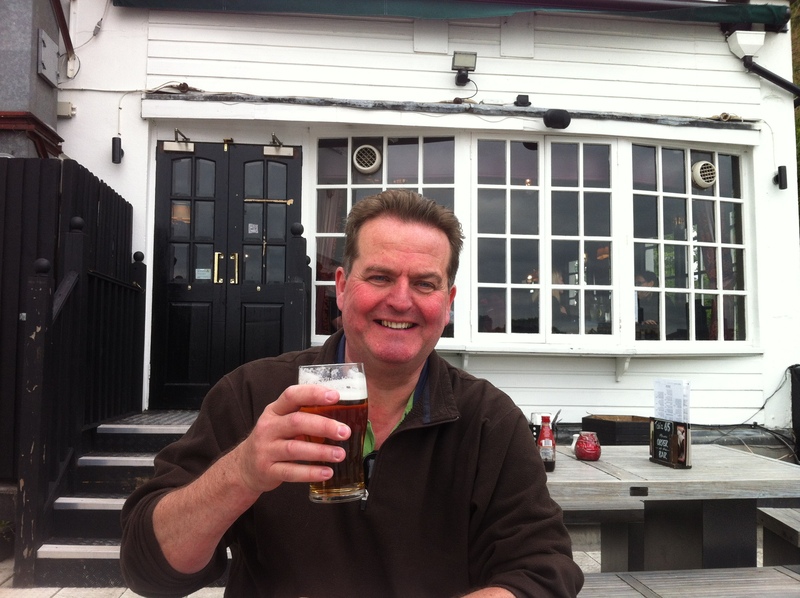 But these were mitigated by a number of landmarks, two river crossings (one above, one below) and a pub lunch. The latter was sufficient to tempt Russ to get his boots on and join me. 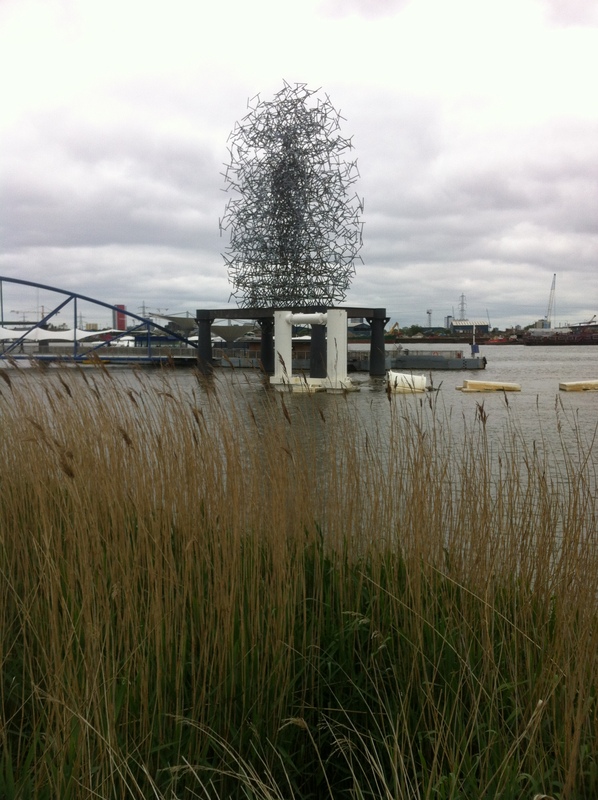 We started at Beckton DLR and walked past Royal Albert and King George V docks and City Airport. The airport was disappointingly quiet. Nothing at all moved, and it wasn’t even that early. I was looking forward to our first river crossing via the Woolwich Ferry, partly because I had never done it before and partly because I can’t quite believe that two of London’s major routes – the north and south circulars – still meet via a small ferry. I was even more incredulous when I discovered that on a Sunday the first boat doesn’t cross until 11.30! So we stood and waited a while. But having done the crossing I am now full of admiration for the helmsman. It’s only a short crossing but the tide was ripping up the river; it must take some skill to cross and dock within a few minutes each time with the tide racing in, or racing out, or even when it’s doing neither. I tried to take a photo but discovered that I had made a schoolboy error and allowed my camera battery to go flat. Hence today’s photos are from phones and lower-res than usual. And a bit dark. Having made the crossing we headed west along the riverside path and a bearded man on a bicycle with full panniers rode by and shouted a cheery greeting. 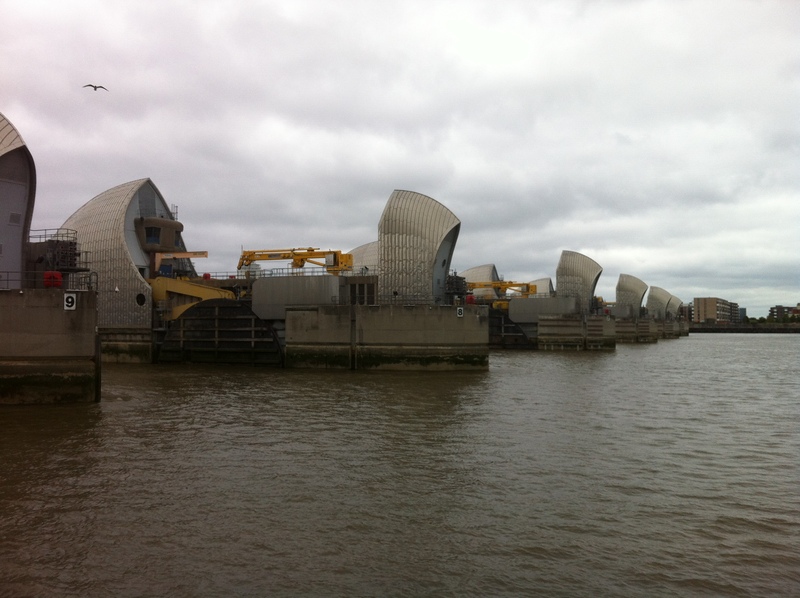 Soon we were diverted away from the river for a mile or two through a rather grim part of town until we were able to return to the waterside at the Thames Barrier. 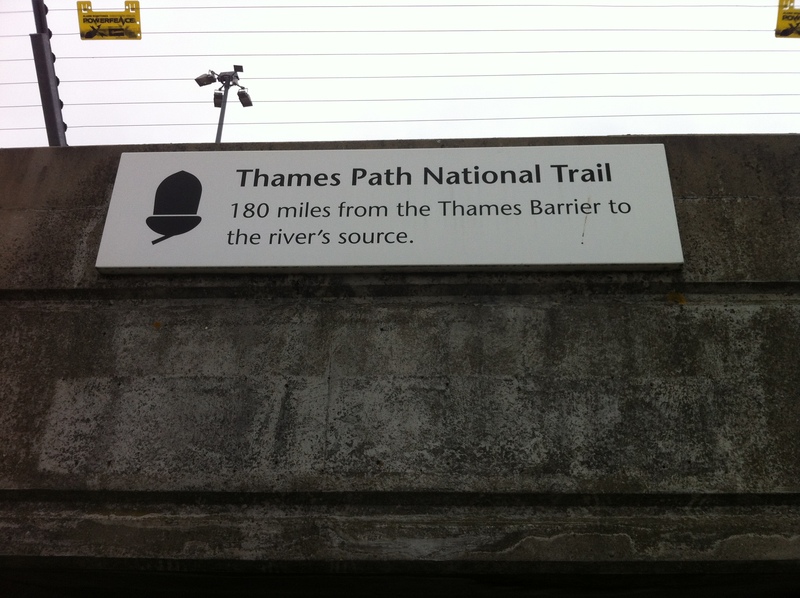 The barrier marks the start of the Thames Path and carries a helpful and sobering reminder that there’s still 180 miles to go to the source. Later we noticed the bearded cyclist and his bike with its panniers off to one side of the path. He was carrying out running repairs but we figured he would soon be overtaking us again. Sure enough, a short distance further on he again passed with a cheery greeting. I don’t know whether he thought we were new people he hadn’t yet greeted, or if he just really liked us. 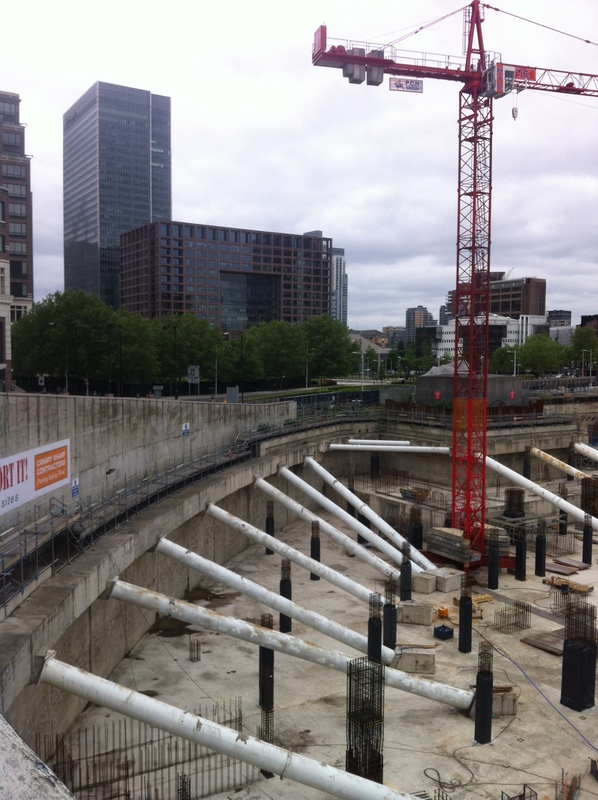 Along the stretch between Woolwich and Greenwich there is still a lot of rebuilding going on. But in amongst all the concrete and brick-dust there is a little oasis in the form of the Greenwich Peninsula Ecology Park. It is four acres of “bio-diverse urban wetland”, they say. We didn’t venture far into the park, but it looks worthy of a visit. 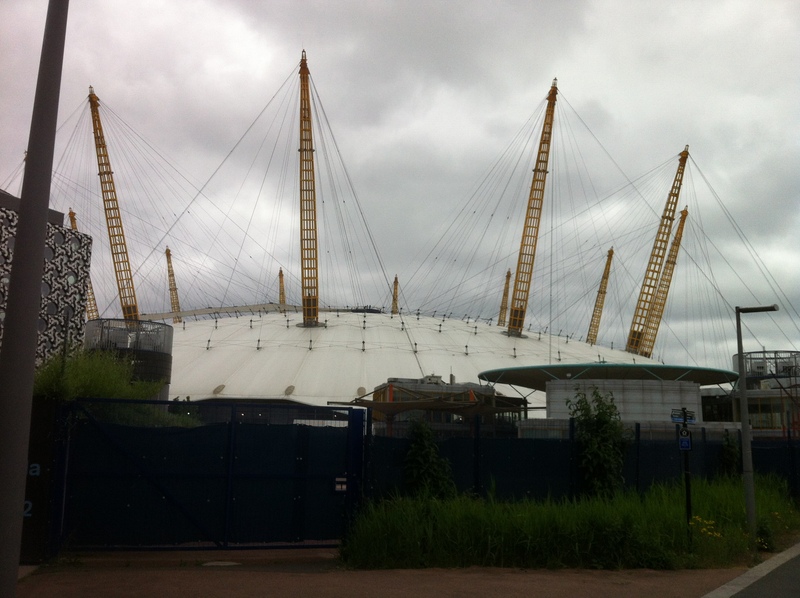 Then there was the Millennium Dome (sorry sponsors: “The O2 Arena”), which is anything but bio-diverse. There were people walking around on top of the thing! You can take a walking tour which includes going up a steep walkway to the top of the dome. It costs 28 quid though, so it’s a bit steep in both senses of the word. But there is the alternative of the cable car which takes you up to 90m high (nearly twice the height of the dome) and only costs £3.20. Greenwich has many attractions. 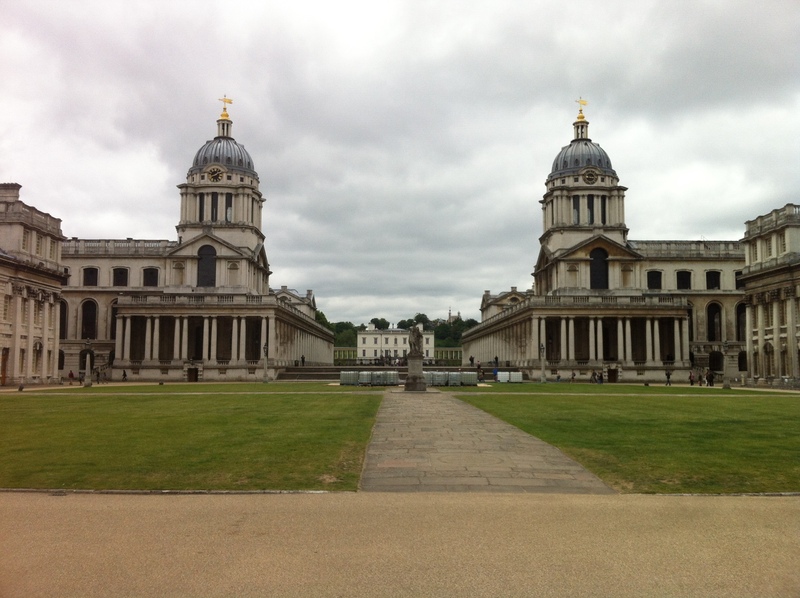 There is the Old Naval College, the Maritime Museum, the Meridian, the Royal Observatory, the Cutty Sark. The Ecology Park. 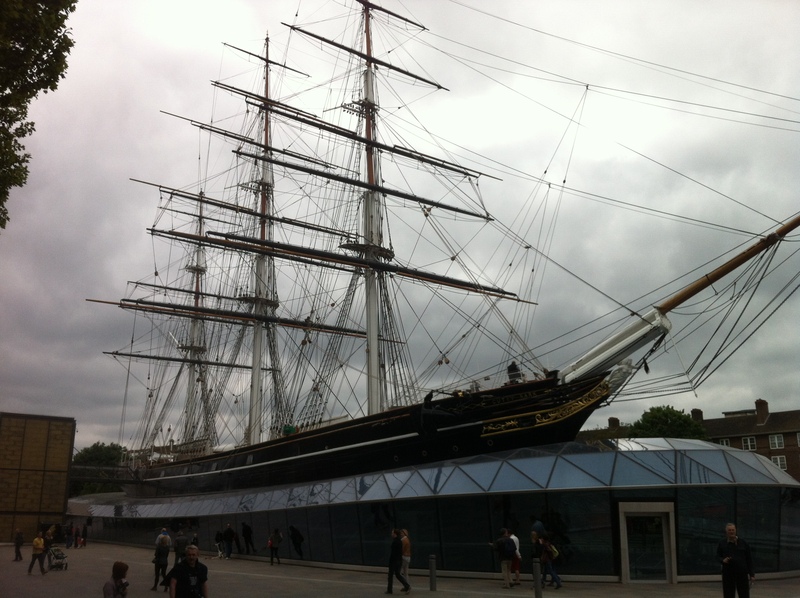 Russ and I agreed that we would return for a full day when we would allow ourselves time to absorb all the culture of Greenwich, along with lunch at the Trafalgar and dinner at the Prospect. 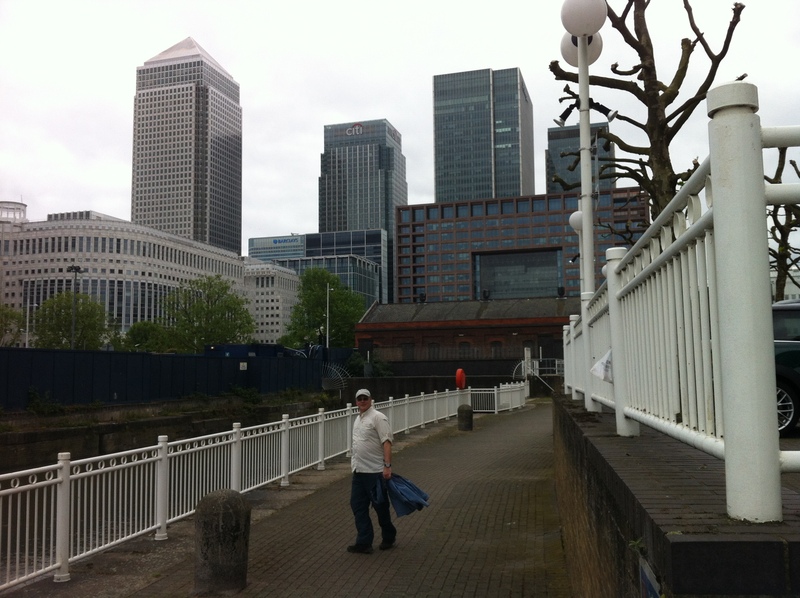 Our second river crossing of the day was via the Greenwich Foot Tunnel, which was opened in 1902 to allow workers to get to the docks and shipyards on the Isle of Dogs. You are not allowed to whistle or ride a tricycle in the tunnel and we managed to resist the temptation to do either. 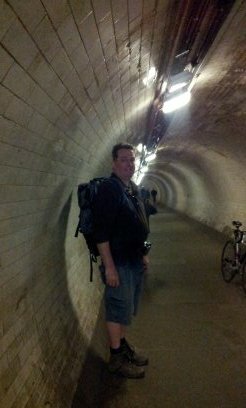 Using the tunnel is much like making your way to a London Underground platform via one of the many tiled tunnels. 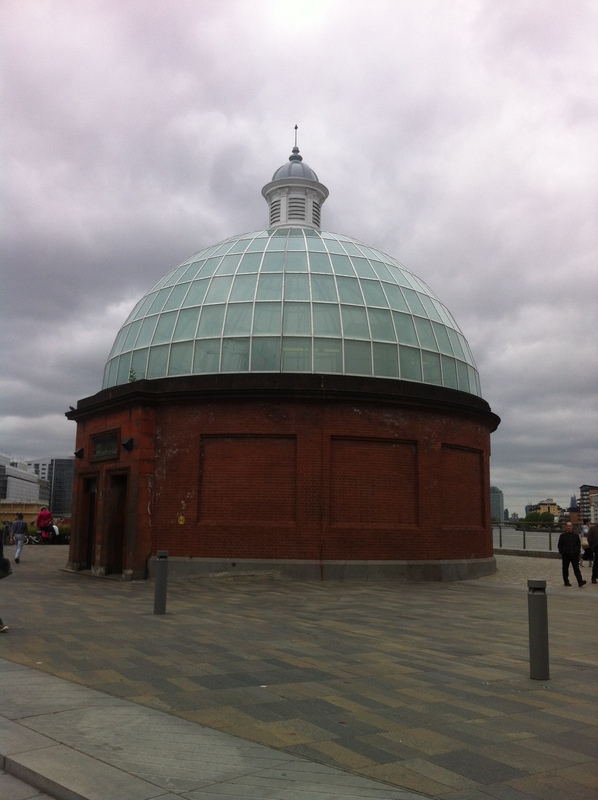 The interest or excitement comes from entering and exiting via the glazed domes on either side and the knowledge that you are walking under the Thames. And then suddenly we were amongst the looming glazed towers of the new city. We were diverted around massive earthworks which will no doubt become another glazed tower. The diversion took us over and around another sub-Thames crossing, the Rotherhithe Tunnel, which very nearly became the watery grave of the young Isambard Kingdom Brunel. 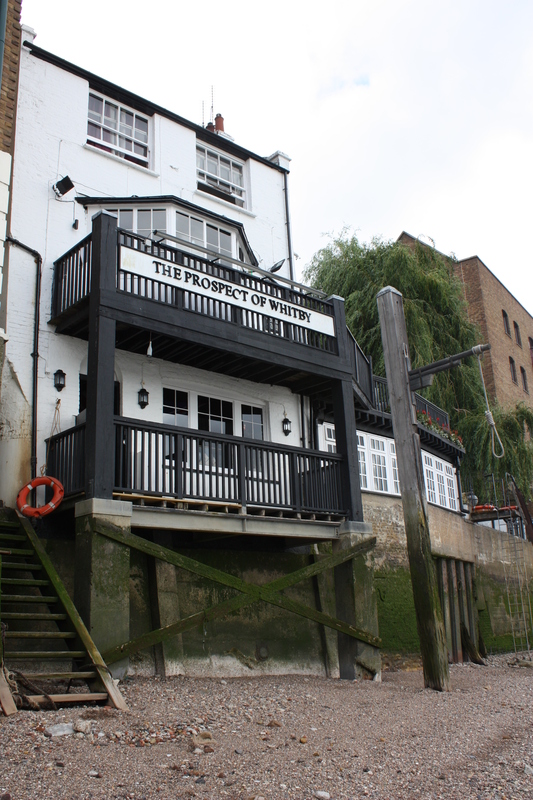 And so to today’s destination: The Prospect of Whitby in Wapping. This is a pub with hundreds of years of history behind it; It has been through several incarnations, but the original 400 year-old stone floor remains. At one time due to its bad reputation it was known as The Devil’s Tavern. Views from the pub were sketched by both Turner and Whistler. Charles Dickens and Samuel Pepys were known to have popped in for the odd pint, and Hanging Judge Jeffreys was something of a regular. Quiz night must have got very competitive back in the day. We sat at Princess Margaret’s favourite table and enjoyed a fine lunch and watched the boats go by. Sorry, Noel – you failed to mention the world-renowned fan museum in Greenwich. You & Russ could have a fine time fluttering in there when you return. Also – stop answering work calls on your day off!